The site was used as a meditation retreat by King Songtsen Gampo (sōng zàn gān bù 松赞干布), who built the first palace there in 637 in order to greet his bride Princess Wen Cheng (wén chéng gōng zhǔ 文成公主) of the Tang Dynasty (táng cháo 唐朝) of China. Lozang Gyatso (luò sāng jiā cuò 洛桑嘉措), the Great Fifth Dalai Lama (wǔ shì dá lài lǎ mā 五世达赖喇嘛), started the construction of the Potala Palace (bù dá lā gōng 布达拉宫) in 1645 after one of his spiritual advisers, Konchog Chophel , pointed out that the site was ideal as a seat of government, situated as it is between Drepung and Sera monasteries and the old city of Lhasa. The Dalai Lama and his government moved into the Potrang Karpo (White Palace, bái gōng 白宫) in 1649. Construction lasted until 1694, some twelve years after his death. The Potala was used as a winter palace by the Dalai Lama from that time. The Potrang Marpo (Red Palace, hóng diàn 红殿) was added between 1690 and 1694. "The new palace got its name from a hill on Cape Comorin (kē mó lín jiǎo 科摩林角) at the southern tip of India—a rocky point sacred to the God of Mercy, whom the Indians call Avalokitesvara (guān yīn 观音) and the Tibetans worship as Chenrezi. The Tibetans themselves rarely speak of the sacred place as the ‘Potala’ but rather as ‘Peak Potala’ (Tse Potala), or usually as ‘the Peak’. The palace was slightly damaged during the Tibetan uprising against the Chinese in 1959, when Chinese shells were launched into the palace's windows. It also escaped damage during the Cultural Revolution (wén huà dà gé mìng 文化大革命) in 1966 through the personal intervention of Zhou Enlai (zhōu ēn lái 周恩来), who was the Premier of the People's Republic of China but who personally opposed the revolution. Still, almost all of the over 100,000 volumes of scriptures, historical documents and other works of art were removed, damaged or destroyed. 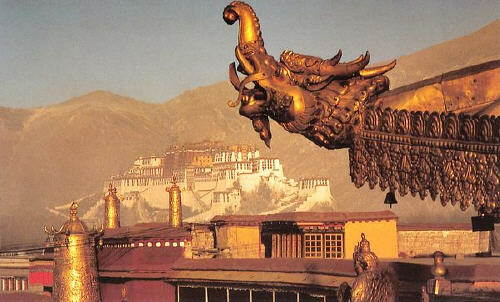 The Potala Palace was inscribed to the UNESCO World Heritage List in 1994. In 2000 and 2001, Jokhang Temple (dà zhāo sì 大昭寺) and Norbulingka (luó bù lín kǎ 罗布林卡) were added to the list as extensions to the sites. 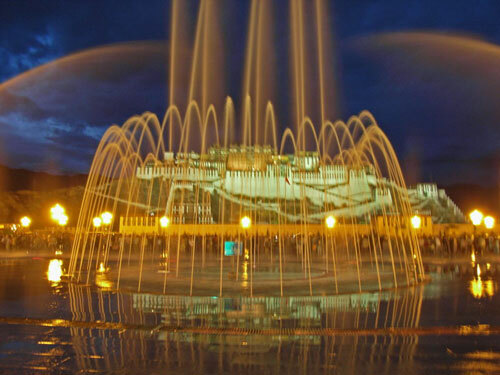 Rapid modernization has been a concern for UNESCO, however, which expressed concern over the building of modern structures immediately around the palace which threaten the palace's unique atmosphere. The Chinese government responded by enacting a rule barring the building of any structure taller than 21 meters in the area. 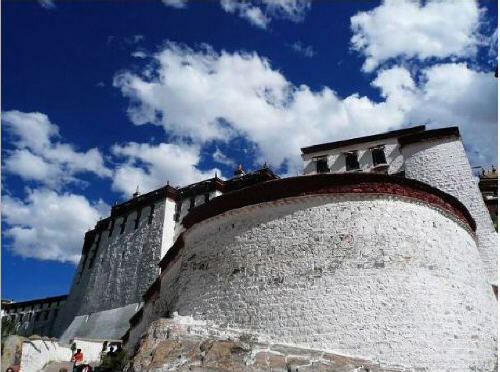 UNESCO was also concerned over the materials used during the restoration of the palace, which commenced in 2002 at a cost of RMB180 million, although the palace's director, Qiangba Gesang (qiáng bā gé sāng 强巴格桑), has clarified that only traditional materials and craftsmanship were used. The palace has also received restoration works from 1989 to 1994, costing RMB55 million. Daily visitor ship to the palace was restricted to 1,600 a day, with opening hours reduced to six hours daily to avoid over-crowding from 1 May 2003. The palace was receiving an average of 1,500 a day prior to the introduction of the quota, sometimes peaking to over 5,000 in one day. Visits to the structure’s roof were banned after restoration works were completed in 2006 to avoid further structural damage. Visitor ship quotas were raised to 2,300 daily to accommodate a 30% increase in visitor ship since the opening of the Qingzang railway (qīng zàng tiě lù 青藏铁路) into Lhasa (lā sà 拉萨) on 1 July 2006, but the quota is often reached by mid-morning. Opening hours were extended during the peak period in the months of July to September, where over 6,000 visitors would descend on the site. 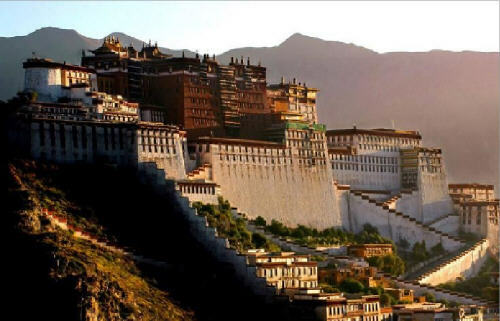 Built at an altitude of 3,700 m, on the side of Marpo Ri (Red Mountain, hóng shān 红山) in the center of Lhasa Valley, the Potala Palace, with its vast inward-sloping walls broken only in the upper parts by straight rows of many windows, and its flat roofs at various levels, is not unlike a fortress in appearance. At the south base of the rock is a large space enclosed by walls and gates, with great porticos on the inner side. A series of tolerably easy staircases, broken by intervals of gentle ascent, leads to the summit of the rock. The whole width of this is occupied by the palace. The central part of this group of buildings rises in a vast quadrangular mass above its satellites to a great height, terminating in gilt canopies similar to those on the Jokhang. 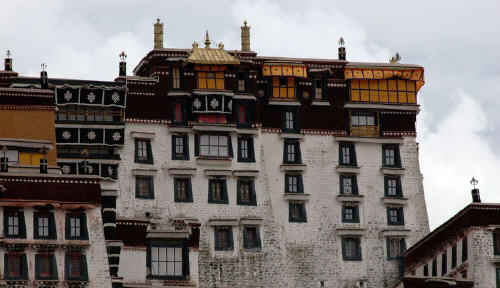 This central member of Potala is called the "red palace" from its crimson color, which distinguishes it from the rest. It contains the principal halls and chapels and shrines of past Dalai Lamas. There is in these much rich decorative painting, with jeweled work, carving and other ornament. The Chinese Putuo Zongcheng Temple, built between 1767 and 1771, was modeled after the Potala Palace. It was named by the American television show Good Morning America and newspaper USA Today as one of the "New Seven Wonders". The White Palace is the part of the Potala Palace that makes up the living quarters of the Dalai Lama. The first White Palace was built during the lifetime of the Fifth Dalai Lama and he and his government moved into it in 1649. It then was extended to its size today by the thirteenth Dalai Lama in the early twentieth century. The palace was for secular uses and contained the living quarters, offices, the seminary and the printing house. 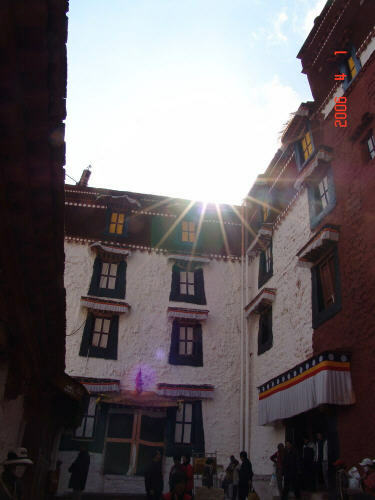 A central, yellow-painted courtyard known as a Deyangshar separates the living quarters of the Lama and his monks with the Red Palace, the other side of the sacred Potala, which is completely devoted to religious study and prayer. 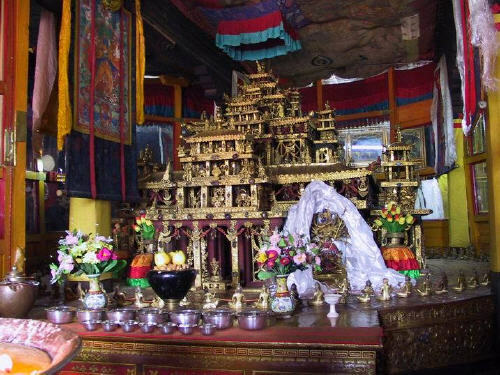 It contains the sacred gold stupas—the tombs of eight Dalai Lamas—the monks' assembly hall, numerous chapels and shrines, and libraries for the important Buddhist scriptures, the Kangyur in 108 volumes and the Tengyur with 225. 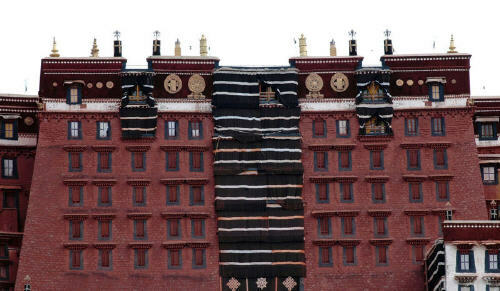 The yellow building at the side of the White Palace in the courtyard between the main palaces houses giant banners embroidered with holy symbols which hung across the south face of the Potala during New Year festivals. The Red Palace is part of the Potala palace that is completely devoted to religious study and Buddhist prayer. It consists of a complicated layout of many different halls, chapels and libraries on many different levels with a complex array of smaller galleries and winding passages. The main central hall of the Red Palace is the Great West Hall (xī dà diàn 西大殿) which consists of four great chapels that proclaim the glory and power of the builder of the Potala, the Fifth Dalai Lama. The hall is noted for its fine murals reminiscent of Persian miniatures, depicting events in the fifth Dalai Lama's life. The famous scene of his visit to Emperor Shun Zhi (shùn zhì dì 顺治帝) in Beijing is located on the east wall outside the entrance. Special cloth from Bhutan wraps the Hall's numerous columns and pillars. On the north side of the Saint's Chapel (líng tǎ diàn 灵塔殿) in the Red Palace is the holiest shrine of the Potala. A large blue and gold inscription over the door was written by the 19th century Tongzhi Emperor (tóng zhì dì 同治帝) of China. Proclaiming Buddhism is a Blessed Field of Wonderful Fruit. This chapel like the Dharma cave below it dates from the seventh century. It contains a small ancient jewel encrusted statue of Avalokiteshvara and two of his attendants. On the floor below, a low, dark passage leads into the Dharma Cave where Songsten Gampo is believed to have studied Buddhism. In the holy cave are images of Songsten Gampo, his wives, his chief minister and Sambhota, the scholar who developed Tibetan writing in the company of his many divinities. The North Chapel centers on a crowned Sakyamuni Buddha on the left and the Fifth Dalai Lama on the right seated on magnificent gold thrones. Their equal height and shared aura implies equal status. On the far left of the chapel is the gold stupa tomb of the Eleventh Dalai Lama who died as a child, with rows of benign Medicine Buddha who were the heavenly healers. On the right of the chapel are Avalokiteshvara and his historical incarnations including Songsten Gampo and the first four Dalai Lamas. Scriptures covered in silk between wooden covers form a specialized library in a room branching off it. The South Chapel centers on Padmasambhava, the 8th century Indian magician and saint. His consort Yeshe Tsogyal, a gift from the King is by his left knee and his other wife from his native land of Swat is by his right. On his left, eight of his holy manifestations meditate with an interned gaze. On his right, eight wrathful manifestations wield instruments of magic powers to subdue the demons of the Bön faith. The East chapel is dedicated to Tsong Khapa, founder of the Gelug tradition. His central figure is surrounded by lamas from Sakya Monastery who had briefly ruled Tibet and formed their own tradition until converted by Tsong Khapa. Other statues are displayed made of various different materials and display noble expressions. This is the chapel that contains the five golden stupas. The enormous central stupa, 14.85 m high, contains the mummified body of the Fifth Dalai Lama. This stupa is built of sandalwood and is remarkably coated in 3,727 kg of solid gold and studded with 18,680 pearls and semi-precious jewels. On the left is the funeral stupa for the Twelfth Dalai Lama and on the right that of the Tenth Dalai Lama. The nearby stupa for the 13th Dalai Lama is 22 m high. The stupas on both ends contain important scriptures. The first gallery is on the floor above the West chapel and has a number of large windows that give light and ventilation to the Great West Hall and its chapels below. 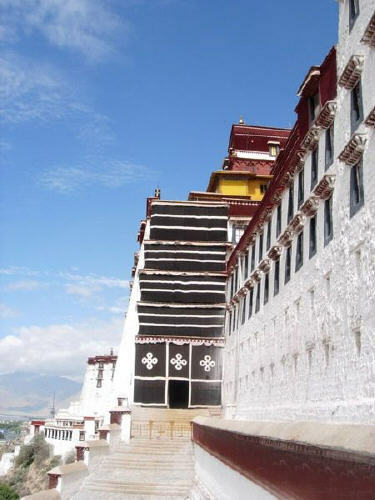 Between the windows, superb murals show the Potala's construction is fine detail. The Second Gallery gives access to the central pavilion which is used for visitors to the palace for refreshments and to buy souvenirs. The Third Gallery besides fine murals has a number of dark rooms branching off it containing enormous collections of bronze statues and miniature figures made of copper and gold worth a fortune. The chanting hall of the Seventh Dalai Lama is on the south side and on the east an entrance connects the section to the Saints chapel and the Deyangshar between the two palaces. The tomb of the 13th Dalai Lama is located west of the Great West Hall and it can only be reached from an upper floor and with the company of a monk or a guide of the Potala. 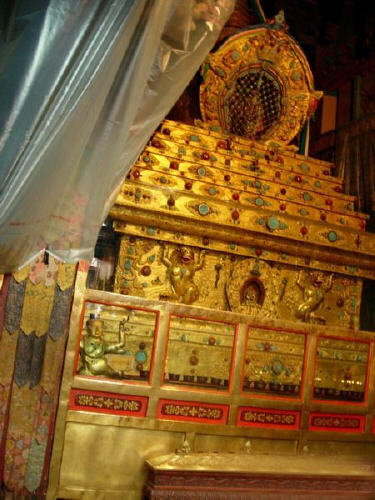 Built in 1933, the giant stupa contains priceless jewels and one ton of solid gold. It is 14 m high. Devotional offerings include elephant tusks from India, porcelain lions and vases and a pagoda made from over 200,000 pearls. 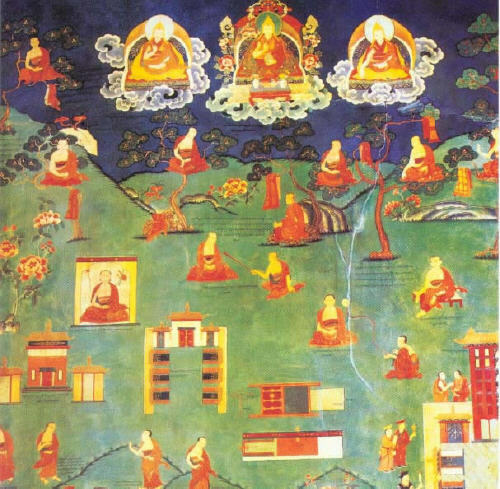 Elaborate murals in traditional Tibetan styles depict many events of the life of the Thirteenth Dalai Lama during the early 20th century. The building today is filled with the same sounds (chanting) and scents (incense and yak-butter burning lamps) that visitors encountered centuries ago. The Potala Palace was the world's tallest occupied building from 1653 to 1889. The views from the Potala Palace's roof and balconies are spectacular. Below lies Lhasa city and, beyond, the valley countryside and distant snow-capped Himalayan mountains. The Potala Palace is 3,700 meters (12,000 feet) above sea level. Therefore, it is advisable to rest during your first day in Tibet to acclimate yourself to the thin air before exploring the Potala Palace. The 13 story Potala Palace has no elevator, so walk up, not down its stairways. There are three sets of stairways, which are steep and ladder type. Only the Dalai Lama was allowed to use the middle one. The Potala Palace also has outdoor ramp steps skirting its flanks. The current building was constructed in the 17th century on the foundation ruins of a fortress palace built a thousand years earlier. The cliff faces behind the front bottom half of the Potala Palace slopes backward. This enables the hill to bear some of the building's massive gravity induced weight load. The architects added more support by embedding some of the building's structural beams into the cliff. The government has launched a major renovation project to repair the serious damage caused over the years by wind, rain, timber-eating worms, and a sinking foundation (evidenced by cracks in the walls). You can take a taxi to the top of Potala and walk from the top to the bottom.